The greatest superstition of the 20th Century - Miata Turbo Forum - Boost cars, acquire cats. The majority of people in the 19th century believed in all kinds of mysticism. In the 20th Century, the greatest superstition is the blind belief in gov't - i.e., that gov't is truly a force for good, and is there to help the common man. You may or may not agree with Rose's conclusions, but you should be prepared to have many of your own cherished beliefs challenged and examined. This is a book to stretch your mind, and that may be uncomfortable, if your mind is out-of-shape. But like any good workout, the results are very rewarding. The "most dangerous superstition" referred to in the title is the idea of "authority," which includes all belief in "government." No, I'm not providing "spoilers;" this is something Rose lays out on Page 2 of the book. He doesn't deny that all the legislators, police, bureaucrats and soldiers exist -- they clearly do. But the thing that makes "government" something more than a gang of thugs is the respect -- even reverence -- in which it is held by the people it rules. "Government" is commonly believed to have a RIGHT to rule us, and we commonly believe ourselves to have a DUTY to obey their commands (which are called "laws.") Rose unleashes a ferocious array of arguments proving that neither that RIGHT nor that DUTY can logically -- or morally -- exist. If that sounds silly to you, YOU need to read the book. The most dangerous superstition IS dangerous because it enslaves our minds, which leads to the enslavement of our whole lives. This is a book to set us free. "Cant expect a kid to change if all you do is tell him." "If you would just get up and teach us instead of handing 'em a packet yo, there's kids in here that don't learn like that... they need to learn face-to-face." I'd like to see poll results if you ask a large number of Americans, "Do you believe that government is truly a force for good, and is there to help the common man?" I am skeptical that it is a view held by a majority of people. In an ideal republic, the government should either consist of the people or be representative of, and subservient to, the people. It is a mistake to assume that the only thing which separates any government from a gang of thugs is a sense of respect or reverence. That would be true of an oligarchy or an "ideal" fascist government. In other words, a "gang of thugs" typically don't bother to draft a constitution or allow themselves to be voted in and out of power by a system of organized and regular elections. One of my all-time favorites, I actually have that one on Laserdisc. The majority may not say yes when asked this directly, but then they will Doublethink, e.g. "Gov't stay out of my Medicare" and "Fedex is more reliable than USPS, but I believe we need Obamacare" and "I am pro choice but gov't should stop you from choosing incandescent light bulbs or non-low-flush toilets". Today's gang of thugs metastasized from the original design of the Constitution. The Supreme Court which but another tentacle of the Federal monster, has so bastardized its interpretation that the monster barely resembles the original intent. Despite that the thugs hate the remaining restraints the Constitution still imposes. Do you code in the Matrix or something? Because I swear you are only able to think in binary terms. Someone can believe that government can serve beneficial functions while also rejecting the notion that "gov't is truly a force for good, and is there to help the common man." That's a silly oversimplification that I believe most people would reject. One thing I'm 100% certain of. Gov't is waaaay bigger than what's best for society. The largest it should be is along the lines of what the founders of this country envisioned. Perhaps most people would reject the simplified statement, and yet would readily accept the "gov't must do something" statement in reaction to the next tragedy, no matter how miniscule, such as the 7 ladies who tragically burned to death in a limo. DOUBLETHINK. Today's gang of thugs metastasized from the original design of the Constitution. The Supreme Court which but another tentacle of the Federal monster, has so bastardized its interpretation that the monster barely resembles the original intent. It's as though the authors of the constitution had some weird delusion that they were not perfect and all-knowing, and that as time progressed, it might be necessary for laws, and the interpretation of laws, to change in order to accommodate situations which they could not foresee. I think you've expressed that better than I ever could have. The Founders considered the States to be the final arbiter of what's constitutional and what's not. That's what the 10th Amendment is for. No, they didn't. And no, it's not. Note that section 2 also grants the US Supreme Court (and the "inferior" Federal courts) authority over many legal disputes concerning the States themselves. Specifically "to Controversies between two or more States;-- between a State and Citizens of another State,--between Citizens of different States,--between Citizens of the same State claiming Lands under Grants of different States, and between a State, or the Citizens thereof, and foreign States, Citizens or Subjects." What aspect of constitutional law would you like to learn about next? Last edited by Joe Perez; 05-10-2013 at 08:39 PM. 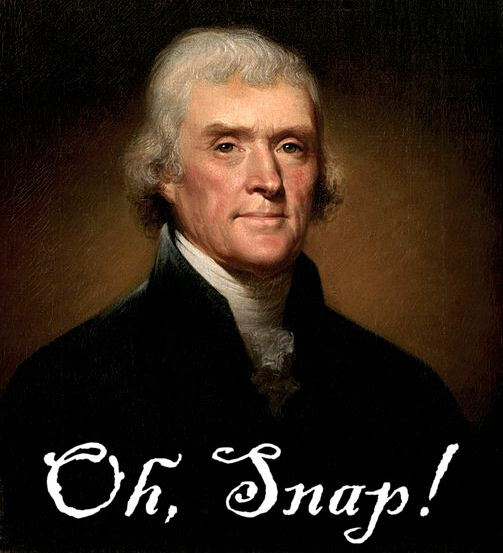 Reason: Added Thomas Jefferson saying "Oh, Snap!" Says Thomas Jefferson, among other distinguished Americans. His draft of the Kentucky Resolutions of 1798 first introduced the word “nullification” into American political life, and follow-up resolutions in 1799 employed Jefferson’s formulation that “nullification…is the rightful remedy” when the federal government reaches beyond its constitutional powers. 1) The states preceded the Union. 2) In the American system no government is sovereign. The peoples of the states are the sovereigns. Nullification was never used on behalf of slavery. Jason, dude. You know better than to make such an over-reaching statement about...wait, nevermind. Nullification was used by both sides with respect to slavery - both on behalf of, and against. blaen, dude, how about an example of nullification used to support slavery? If the concept of state nullification had ever been anything more than a random concept (which it wasn't) then it would simply have been an avenue for the States to challenge the constitutionality of a federal law through the US Supreme Court. Which, by odd coincidence, is exactly how things work here in the real world even today. Jason, dude, it's not my job to educate you on basic history. But here's a start. When South Carolina nullified the tariffs put on it by the government, they were saying that not only did they have the right to nullify tariffs, but potentially they had the right to nullify any laws that would try to prohibit slavery in their states. When the Federalists passed the Alien and Sedition Acts in 1798, Thomas Jefferson and James Madison secretly wrote the Kentucky and Virginia Resolutions, which provide a classic statement in support of states' rights. According to this theory, the Federal Union is a voluntary association of states and if the central government goes too far, each state has the right to nullify that law. One major and continuous strain on the union, from roughly 1820 through the Civil War, was the issue of trade and tariffs. Heavily dependent upon trade, the almost entirely agricultural and export-oriented South imported most of its manufactured needs from Europe or obtained them from the North. The North, by contrast, had a growing domestic industrial economy that viewed foreign trade as competition. Trade barriers, especially protective tariffs, were viewed as harmful to the Southern economy, which depended on exports. In 1828, the Congress passed protective tariffs to benefit trade in the northern states, but were detrimental to the South. Southerners vocally expressed their tariff opposition in documents such as the South Carolina Exposition and Protest in 1828, written in response to the "Tariff of Abominations". Exposition and Protest was the work of South Carolina senator John C. Calhoun, formerly an advocate of protective tariffs and internal improvements at federal expense. South Carolina's Nullification Ordinance declared the tariff of 1828 and 1832 null and void within the state borders of South Carolina. It began the Nullification Crisis. Passed by a state convention on November 24, 1832, it led, on December 10, to President Andrew Jackson's proclamation against South Carolina, which sent a naval flotilla and a threat of sending government ground troops to enforce the tariffs. Over the following decades, another dispute over states' rights moved to the forefront. The issue of slavery polarized the union, with the principles espoused by Thomas Jefferson often being cited by both anti-slavery Northerners and secessionists on the debates that ultimately led to the American Civil War. SUPPORTERS OF SLAVERY OFTEN ARGUED THAT ONE OF THE RIGHTS OF THE STATES WAS THE PROTECTION OF SLAVE PROPERTY wherever it went, a position endorsed by the Supreme Court in the 1857 Dred Scott decision. "Resolved, That the union of these States rests on the equality of rights and privileges among its members, and that it is especially the duty of the Senate, which represents the States in their sovereign capacity, to resist all attempts to discriminate either in relation to person or property, so as, in the Territories -- which are the common possession of the United States -- to give advantages to the citizens of one State which are not equally secured to those of every other State"
The Preamble to the Confederate States Constitution begins: "We, the people of the Confederate States, EACH STATE ACTING IN ITS SOVEREIGN AND INDEPENDENT CHARACTER..."
The famous nullification confrontation of 1832-1833, pitting President Andrew Jackson against South Carolina senator John C. Calhoun over whether a state could nullify federal law, was an important step in a long series of attempts to define the proper powers of the states. As industry in the North expanded it looked towards southern markets, rich with cash from the lucrative agricultural business, to buy the North's manufactured goods. However, it was often cheaper for the South to purchase the goods abroad. In order to "protect" the northern industries Jackson slapped a tariff on many of the imported goods that could be manufactured in the North. When South Carolina passed the Ordinance of Nullification in November 1832, refusing to collect the tariff and threatening to withdraw from the Union, Jackson ordered federal troops to Charleston. A secession crisis was averted when Congress revised the Tariff of Abominations in February 1833. Behind the explicit assault on the tariff lay another implicit concern--protecting slavery. The South Carolina coastal plains, largely a rice-producing region, was the most densely enslaved southern area and thus particularly sensitive to America's first antislavery stirrings. South Carolina rice planters feared nationalistic tariffs, bad enough in themselves, would furthermore lead to assaults on slavery. They thus joined their cotton-producing upland cousins in defying Jackson. Other than that, ditto Joe. Wherever you get this revisionist history from is probably something you should be taking with a grain or two of salt. blaen dude, you're so predictable. Only a zombie liberal would think that centralization of power is a good thing. Only a zombie liberal would assume on the average States would pass bad laws and the Fed Gov good laws; The Dred Scott decision was a *bad* Supreme Court decision. States' Rights proponents wanted to nullify the Fugitive Slave Act (a Federal law that required slaves that escaped into other States where slavery was outlawed to be returned to their owners). With de-centralized power people (and slaves) could move States. With centralized power there is less recourse.